“Cool” Archaeology on Tap for January! The upcoming archaeological investigations now scheduled for early January (2008) are intended to uncover some important components of the eighteenth century Walled City of Charles Town. We are hopeful that we can locate, map, and study the remains of the redan and the lower market that were located on the site. Here’s a sneak peek at what we’re looking for. This small structure, known as a redan, was part of the main line of colonial fortifications that faced Charleston Harbor. 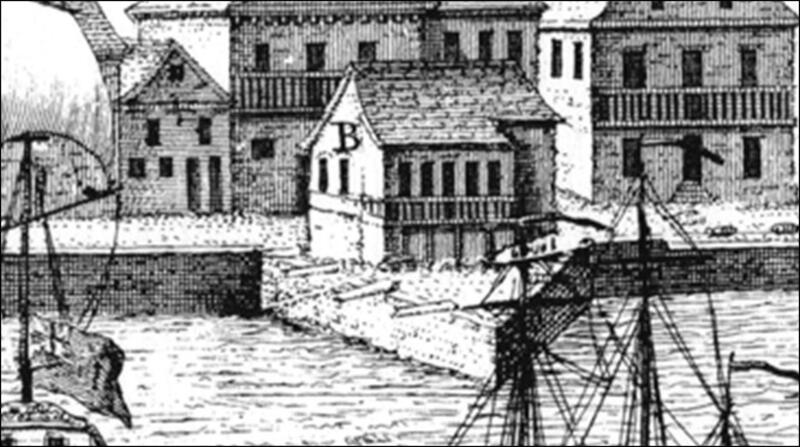 This line of brick fortifications was begun along the east side of the Bay Street in the 1690s. Based on European fortification design principles of the day, the angled walls of the redan allowed the five or six cannon mounted within to fire at a wider range of potential targets, and thus better protect the curtain wall and the city from naval assault. When it was built three hundred year ago, the Cooper River washed the redan’s brick walls at high tide. Since that time, the mud flats on the east side of East Bay Street have been built up with silt, ballast stones, trash, and other materials.By 1784 or 1785, when the redan at the east end of Tradd Street was finally removed, an extensive wharf stood between it and the channel of the Cooper River. This extension of Tradd Street is now known as South Adger’s Wharf. A major fire in November 1740, which burned nearly half of Charleston, destroyed the Exchange and Court Room that had recently been built at the east end of Tradd Street. The site sat vacant for several years, except for the presence of the brick redan at the foot of Tradd Street. In 1750 the S.C. legislature approved the building of a new market on a growing wharf on the east side of the brick redan, and construction continued into 1751. From the 1750s onward, the structure was known as the “Lower Market,” to differentiate it from the Beef Market (the site of present City Hall), and provisions of all kinds were sold here, but not slaves. According to a resolution of Charleston City Council in late 1785, after the old brick redan was finally removed, the Lower Market was enlarged, however, it was still too small to accommodate Charleston’s growing market needs, and the site was becoming too congested by the post-Revolutionary expansion of the wharves. In an effort to consolidate the city’s market activities in the new Market Street, this market was closed in 1799, and the city sold the property in early 1800.